Modern world offers many kinds of entertainment nowadays. People are free to do many interesting and exciting things. It is sometimes even hard to fully understand our possibilities as there is so much to choose from. Nevertheless, casino attracts more and more visitors each year. Many of those who simply wanted to see what gambling is, become keen on it. One of the most popular casino games is blackjack. This game is highly intellectual and requires lots of practicing to become successful. 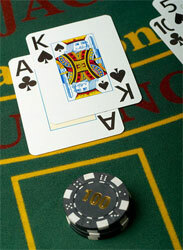 Players have to learn how to play blackjack by memorizing basic blackjack strategy as well as rules. Basic blackjack strategy is the crucial knowledge as it includes set of rules that helps in the understanding of how to read blackjack strategy chart and how to play soft and hard hands. What is Blackjack Strategy Chart? In order to increase blackjack odds players are recommended to learn blackjack strategy chart by heart. It seems to be complicated but once you learn to read it, the chances for winning automatically increase. The chart is the possible and recommended ways of playing with the first two cards. The vertical column shows all possible combination of player's cards and the horizontal column are the combination of dealer's cards. The possible decision for players is where these columns cross. The basic blackjack strategy is very helpful when players know not only this chart but also understand how to play when they have soft and hard hands. In this case it is advised to learn charts for playing soft hands or hard hands. Let's us figure out what it means. Soft hand is the name of a hand with two cards one of which is an Ace. In this case, Ace is counted as 11. There are special rules and strategies when playing soft hand and they differ from basic blackjack strategy and rules for hard hand. Hard hand is the name of a hand where the first two cards do not have Ace or hand with Ace which is counted as 1. There exist a special strategy chart for hard hand and rules of playing. In addition to that, sometimes the initial two cards are turn out to be pair. A special chart for pairs will help players to decide on splitting pairs or not.